That won’t be quite the end of it, of course. Kinkisharyo will still do assembly work in Palmdale as long as its MTA contract lasts and will still employ almost 200 people in its existing assembly plant, but the company says it’s finished with the idea of a long-term manufacturing plant in the area. Labor leaders maintain that the company has an obligation under its contract to create these jobs in Los Angeles County, but the MTA disagrees. Officials at the agency say that while Kinkisharyo had committed to doing the rail car assembly locally, the agency cannot, under federal law, force the company to build in the area. Lawsuits already are being filed, and courts will sift through the arguments for months, maybe years. But that’s all squabbling over the wreckage. The undisputed fact is that a stubborn company and a stubborn union went to war, and because of it, the residents of Palmdale, who could have had a couple of hundred good new jobs, instead will be looking at a vacant lot. Who won that battle? No one. But there are plenty of losers, including California, Los Angeles County, Palmdale and the of men and women who would have built and staffed the manufacturing facility. As Newton writes, the real story here is probably the difficulty of doing business in California. In the meantime, Supervisor Michael D. Antonovich — also a member of the Metro Board of Directors — held a news conference this morning at the County Hall of Administration to discuss the situation. 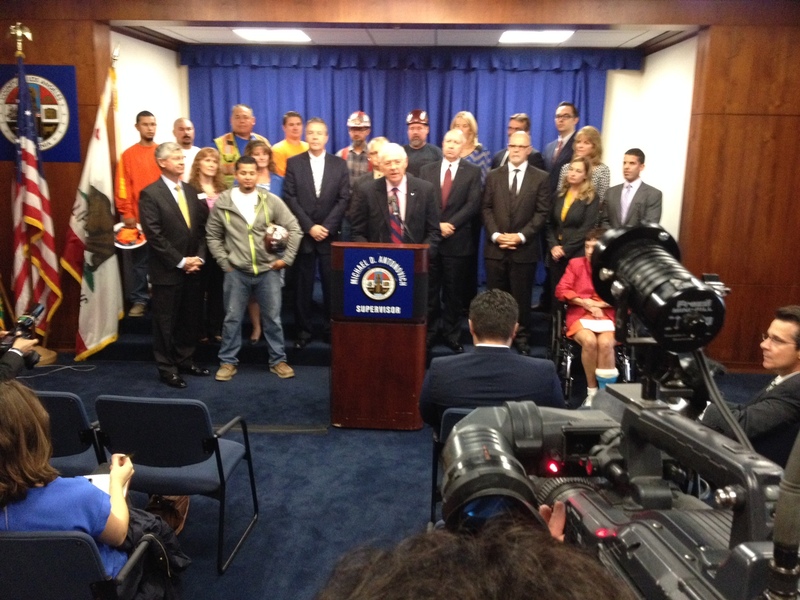 Antonovich called again on Gov. Jerry Brown to ask the union, the IBEW Local 18, to drop its state lawsuit against Kinkisharyo. He also accused the union of supporting a different rail car manufacturer during the bidding process with Metro and that this is a back door attempt by that firm to gain business with Metro. The union is perhaps best known recently for its significant financial support for the losing candidate in last year’s election for mayor of Los Angeles. Palmdale Mayor Jim Ledford said that he was devastated by the news and that it reinforces the notion that California is not business friendly. He reiterated that Palmdale is very open to working with local businesses to keep and create job and that he remains committed to building the new permanent facility for Kinkisharyo. 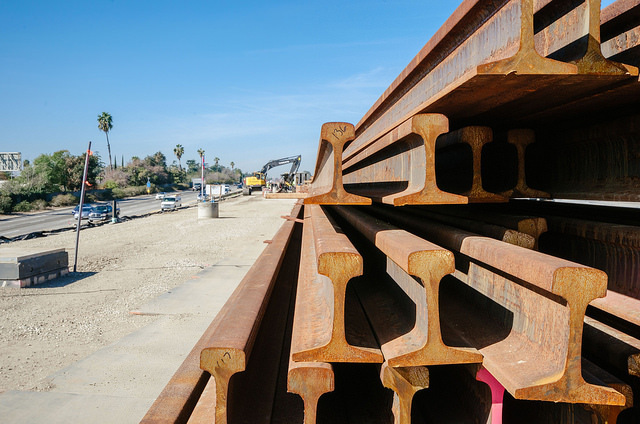 Coverage of the last piece of track work being completed in Saturday for the 11.5-mile Gold Line Foothill Extension between Pasadena and the Azusa/Glendora border. Azusa officials say they are using a Metro grant to study the best ways to use and/or develop land around the two stations in Azusa — one is downtown and the other is adjacent to Citrus College, Azusa Pacific University and the Rosedale development. A bar in the refurbished Union Station in Denver. Photo by Misty Facheux, via Flickr creative commons. Post architecture critic Ray Mark Rinaldi has been visiting the newly revamped Union Station in downtown Denver and by his own counts found the place to be filled with white faces. He finds that troubling, given that 47 percent of Denver’s population are minorities. Still, something is missing. There’s no traditional Mexican restaurant, no soul-food restaurant, no sushi bar, as if no one noticed that the Mexican-American, African-American and Asian-American families that own and operate those places across the city are also our best food purveyors. This country is full of union stations, old train depots, once the center of civic life, that fell out of use in the auto era. St. Louis fixed up its station by adding a mall. It’s not as successful, but it’s diversified. Kansas City filled its hall with a science center, and kids from across the city’s neighborhoods are regulars there. 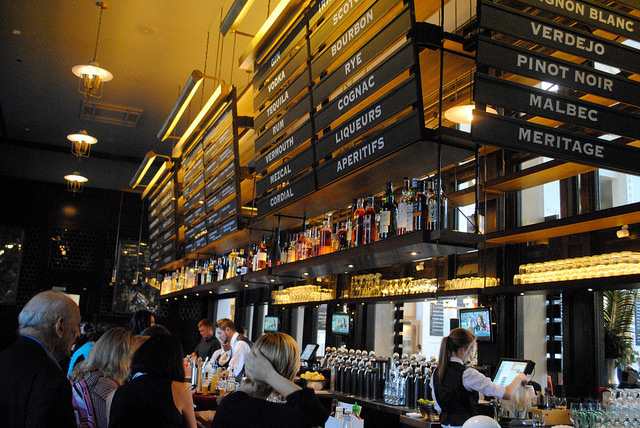 Washington, D.C.’s train station now has swank shops, but also a food court. It has, notably, a B. Smith’s restaurant, part of a small, African-American-owned chain that is a touchstone in the black community. Interesting article and worth a read. I haven’t been to the station in 20 years and have no idea what it’s like now — so it’s hard to form an opinion about the article. Obviously with our Union Station on deck for a major refurbishment and expansion, it’s worth considering such opinions. Manhattan has gotten taller in the past century. But it has also gotten much less dense. The suspected reason: wealth, with fewer people taking up more space. Reminds me of a recent item here on a new Gotham skyscraper that will be the tallest in the city (1,396 feet) and will house only 104 residential units. Again, something to chew on as development continues in downtown. I live in Denver now, after being in LA most of my life. I’ve been to Union Station and that historical hall (akin to the historical waiting room of LA’s Union Station) is maybe 20% the size of LA’s. It doesn’t look like it could accommodate more than 1-2 establishments to begin with, and what won out was a swanky 1920-era bar, a hotel, and a gift shop. I’m not sure there actually is space for more amenities. I think the DP’s point is valid, though Union Station Denver opens out directly into downtown and there are plenty of multicultural destinations within walking distance. It’s just like about a year ago in Washington, DC: after looking at hotels in Washington itself, and remembering that the place I’d stayed at before was expensive and a lot less convenient in real life than it was on paper, I ended up staying at a place in Arlington that was within walking distance of a subway station, and it turned out to be just as convenient, and a lot less expensive. Actually, the present situation between Kinkisharyo and the union reminds me of the lose-lose scenario resulting from the judge’s decision in the lawsuits over Kodak instant cameras. Denver’s Union Station was more of a ghost town at its nadir than LAUS ever was. After the Rio Grande transferred their Zephyr to Amtrak in 1983, 2 trains a day, plus the Ski Train on weekends was it. Tenants at DUS will change over time, and will probably better reflect the region’s food tastes in the near future. Some restaurants will thrive at DUS and others will fail. The fixtures and equipment they leave behind will provide opportunity for a restauranteur who might not otherwise be able to afford a location in Denver’s trendy Lowwr Downtown. Of course there is a winner in the Kinkisharyo dispute: it’s the state that Kinkisharyo will move to! Way to go private sector unions! Helping to create California a business-unfriendly state for years! Next up, let’s raise everyone’s taxes to help fund public employee unions as well! Unions should really stop being so greedy. All they do is create more damage then help. If anything, most jobs are now fleeing this once Golden State and moving to Texas instead. I agree that unions have done a lot to advance social equality like basic minimum wages, lunch hours, workplace safety and child labor laws, so many people do thank unions for those. But there is a limit where the people do start to see them as a problem in job growth for California and America in an ever competent globalized world. Besides, most of union backed laws are set at the federal level by the Fair Labor Standards Act which all states have to abide by. Loosening California’s business unfriendly pro-union laws to promote business growth and our economy is not going to end up back to the era of Dickensian chimneysweepers, cause another Triangle Shirtwaist Factory fire disaster, or poor conditions like Chinese sweatshops. Besides, does anyone really care if the Democrats decides to ditch the union supporter base? No one really does, as stated in many Google searches, union support remains at an all time low. They are insignificant in terms of voters and, even if the Democrats loses union support, where are the unions going to go to? Start voting Republican? That’s equally unrealistic as Republicans ditching the social religious conservative voters and they start voting Democrat. There has to be union reform in this state at all levels, both in the public and private sector. They have become too greedy and too unrealistic when the main priority today should be creating jobs here in California, not making them leave due to a bad business environment. Private sector unions aren’t really the problem, they’ve been getting less and less support for years. Everyone, including them knows that no one likes them anymore and they’re only shooting themselves in the foot. It’s the public sector unions that are the real problem. Government sector employees don’t care whether the economy is good or bad, all they have to do is continue sucking up tax dollars from suckers in California. Look at how much the teachers unions whine and complain about the Vergara lawsuit outcome. They don’t care about the children they teach, all they do is hand out packets, follow Common Core standards, getting their pensions and escape away from California when they retire and make taxpayers pay for their huge pensions. What need to change are CEQA regulations that allow Unions to file environmental suits that they withdraw if their other than environmental demands are met.